Villa De Angeli Frua, or more simply Villa Frua, is set like a precious jewel in Laveno’s old town centre. The building is just a few metres from Lake Maggiore and offers a view of rare beauty. Villa De Angeli Frua was built in the middle of the 1700’s on the wishes of the rich, local Tinelli family, and it was only later acquired towards the end of the 1800’s by the family whose name it still bears and who lived in it until WWII. 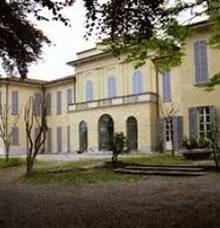 Today, the complex belongs to the municipal administration and Villa Frua is the municipal seat of the Municipality of Laveno Mombello. The villa has hosted important art shows and hosts important conventions and famous exhibits. In the 1970’s, its halls were home to works by some of the most important 20th-century artists including Valerio Adami and Lucio Fontana. In 1997, Villa Frua was closed for renovations so it could later resume its important role for the area. In addition to being the municipal seat, the villa is also the location of the Municipal Library of Laveno, whose over 50,000 volumes make it one of the largest in the entire province of Varese and a Biblioteca Centro Sistema (core library) within the Bibliotecario dei Laghi library system. The marvellous park surrounding the villa dominates Lake Maggiore and is full of century-old plants and typical local essences. Today, Villa Frua Park is a public park. Giuseppe Garibaldi was an illustrious guest at Villa Frua during his campaign against the Austrians in 1859. He was a protagonist in the Risorgimento movement in many areas of Lake Maggiore, both in the province of Varese and in that of Novara and Verbania. He spoke to the people of Laveno from the villa’s balcony overlooking the piazza during his visit in 1862, after the Expedition of the Thousand.